After a season of watching baseball and interacting with fans of both teams, I wanted a Giants-Dodgers NLCS in the worst way. To me, it would have been the ultimate. No more "he said, she said" about which team is better. It could finally be settled on the field like 1951 and 1962 with the winner advancing to the World Series, It would have been a pinnacle for a rivalry that dates back to its roots in New York City. The only problem with my dream hypothetical is that the Dodgers failed to deliver. The Cardinals beat them 3-1 in the NLDS and the Giants get to face another old foe. It doesn't quite have the sizzle that Giant-Dodgers would have had, but the match up just oozes what October baseball is all about. 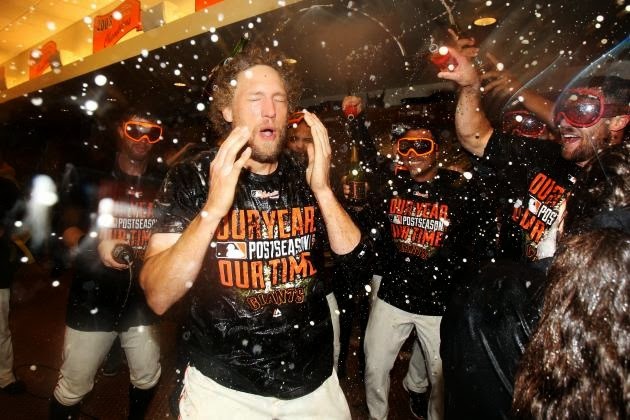 The Giants are in their 3rd NLCS in 5 years. The Cardinals are in their 4th straight. So yes, the rest of America might be getting tired of these two teams. Who cares? We're Giants fans and this is a blast. Let everybody get excited about the ALCS instead. These two teams will just keep going about their business of playing regular October games. The Giants and Cardinals have done this dance 3 times before. Back in 1987 the Cardinals won the NLCS in 7 games despite Jeffery Leonard's MVP performance. In 2002 the Giants got some revenge when Kenny Lofton's base hit sent them to the World Series. Just 2 years ago the Giants crawled back from the dead to rip of 3 straight wins to take the NL crown on their way to World Series victory #2 of the Brian Sabean/Bruce Bochy era. We're going to hear all about "The Cardinal Way" and see lots of #CardinalsDevilMagic tweets as this NLCS rolls on. That's fine. The Giants are comfortable with the spotlight shining somewhere else as they go about the business of winning. It's the team with quiet confidence, "Champion Blood" to steal a phrase if you will, that should come out on top in the end. Seriously, let's keep this whole #ChampionBlood thing trending through the series. As a totally biased Giants fan I am obviously picking them to win this series. I do consider myself objective when I look at teams, but let's face it, I'm probably not. That being said, I'm picking the Giants to beat the Cardinals in 6 games and advance to their 3rd World Series in 5 years. Here's my 3 reasons the Giants move on. The player that has been the backbone to 2 previous championship teams is one Gerald Dempsey Posey. He's not only controlled the pitching staff, but he's come through with the bat as well. We've seen him hit a grand slam in a winner-take-all game and also lace a single to the outfield to keep a 9th inning rally going. Posey has 9 hits in the postseason through 5 games, all singles. He's hit safely in every single game so far in the 2014 playoffs. That gives Posey a 6-game hitting streak heading in to the NLCS. Instead of rally moving singles, Buster needs to start banging out some extra base hits for the Giants to win. Yes it's October and legs are tired, but I think Buster has enough of it in him to make a difference in 1, maybe 2, games in this series. If guys like Joe Panik can get on base for Posey, the Giants should be fine. This probably would have been the space for me to write about the starting pitching in years past. Not this time around. Bumgarner, Peavy, Hudson, and Vogelsong have all pitched well in this year's playoffs, but it's the bullpen that will make the difference. Sergio Romo seems to be comfortable being the set-up guy ahead of Santiago Casilla. Javier Lopez has been utilized by Bruce Bochy perfectly, and who can forget Yusmeiro Petit's NLDS Game 2 heroics? The 4 home runs stand out, if only because they were all solo shots. No other runs have been scored against Giants relievers this postseason. The 18 K's in 19.1 IP is eye popping as well. The 6 walks seems like a lot too, but 3 of them were issued during Pettit's 6 inning stint, and Casilla's one walk was pitching around Bryce Harper. Just yesterday Jonah Keri of Grantland called Bruce Bochy "one of the best managers in baseball history". I totally agree with this statement and it's not just because I'm fat & happy after 2 titles the last few years. We've seen time and again how Bochy is not just a manager of players, but a manager of men. Yes, his in-game tactical skill is excellent, but it's also knowing how to treat each guy that makes him a master. After all, who do you think first uttered a reference to "champion blood"? Just a reminder, I joined the guys over at TortureCast.com for a Giants podcast. We look back at last round and ahead to the Cards. You can listen by clicking here: TORTURECAST EPISODE 73: NLCS!